I don't know about you but during the summer my body craves vegetables. 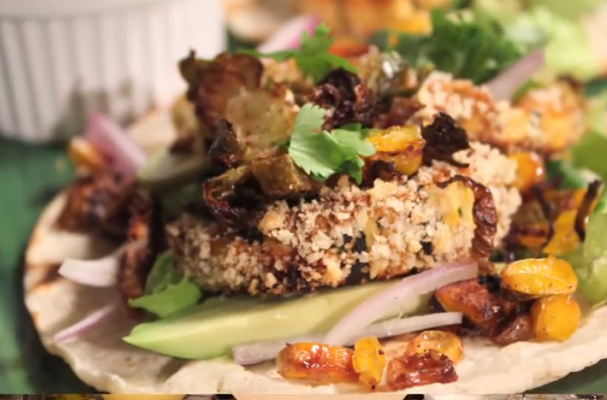 These crunchy delicata squash tacos are guaranteed to satisfy that desire. Slices of squash are dipped in a miso chipotle glaze and coated in panko breadcrumbs. They are baked until the squash is tender and the breadcrumbs have turned a beautiful golden brown color. The crisp squash is served with roasted corn and brussel sprouts (the vegetables can be grilled too), an chipotle orange vinaigrette and your favorite taco toppings. While this video was originally promoted in the fall, I think it is a meal that can be served all year long.